A focus on project process posts and videos. Strategies for designing, layering, composing a layout, and embellishing your layouts and other projects. Hello friends! Welcome back to the Clique Kits blog! Today I am sharing a fun adventure mini album using the September main kit. Like I said in my last post I am just over the moon for this kit! I love all the dark blues and greens, and woodgrain paper always has my heart. You can pick up the kit in the shop here you can also take a look at all the September shop update here. I love putting little mini albums together and this kit is just perfect for all our family outdoor adventures. To start the album I adhered the ‘Take a Hike’ die cut to the center of a 4×4 acetate sheet so you could see the beautiful map paper through it. On the opposite side of the die cut I adhered a wood circle from my stash and added another die cut heart. When the first page is turned I placed one of the 4×6 journal cards cut down to 3.5×3.5 to the left side of the page and paired it with a die cut and a photo of one of my boys on an adventure hike. I repeated the process on the next page but switched the orientation. I also adhered the journal card this time on vellum to add a little bit more interest and texture. I love see through pages and wanted to include another one in the book. For this one I used a printed sheet of acetate and layered a few embellishments on top. This way you can still see the photo through the acetate but till you turn the page you can’t see all the details. To add just a little more detail to the photos, I added a word strip on the edge of all the 3×3 photo stacks. On the next page I added a little journaling and die cuts along with an epoxy arrow from the kit. I adore the little arrows with the map on them! I wanted the last photo to be covered so I added a full 4×4 card to this page to make sure that the final photo was not seen till the page was turned. I ended the mini with a photo of our youngest son. I layered a tag over the photo and added a little burlap bow to mimic the burlap bow at the beginning of the album. I love how the little mini album turned out. I am planning on giving it to my husband to keep in his office. Such a fun and simple project but so meaningful! This is what memory keeping is all about! Categories: Locker Room | Permalink. Hello, Friends! Maryám here to share my last project using the beautiful Malibu 2017 kit. I still have a lot pieces from the kit, so I’m going to continue making more layouts with my kit. For today’s project, I’m going to show you how to make a shaker card. I love shaker cards, and when I saw the beautiful sequin mix that came with the kit, I knew it would be the perfect opportunity to do it. Here are some close-ups of the card: Don’t you think the sequins look perfect? I hope you liked my project. If you have any question, please put them down below. Categories: Locker Room | Tags: August 2017 kit, card, Maryám Pérez, pink paislee, Process Video, scrapbook, Summer Lights | Permalink. Hello, friends! Maryám here again to share another layout made using the Malibu kit 2017. For the main element of my layout, I used an old cut file from CK and I cut it on the paper N°8 with my Silhouette Cameo, and then I added some hand-stitching to it. Here is the result: What I’ve done basically was add a bunch of embellishments around the wreath, then put my photo, the journaling and at the end add some watercolor splatters. You will see the haul of the process in the video at the end of the post. Here is the process video. If you have any questions just let me know. Categories: Locker Room | Tags: Layout, Maryám Pérez, pink paislee, Process Video, scrapbook, Summer Lights | Permalink. Hi everyone! Aren’t you in LOVE with the August Kit, Malibu? I love the soft, watercolor look along with some of the brighter neon colors! I have a whole bunch of sunset photos that I sometimes have a hard time scrapping because the colors are so vibrant (and there are a lot of colors), but I don’t want to take away from the photo by adding too many other distracting elements and patterns on my page. But this collection was PERFECT because the colors are soft and the patterns are not too bold. I cut from sun shapes with my Silhouette Cameo from the Just Nick store and colored each sun in with watercolors to try and match the shades in the paper. I backed each sun with some patterned paper in a similar color. I added a few layers behind my photo, and a cluster of die cuts and chipboard pieces from the kit in the bottom left corner. The title is fussy cut from one of the patterned papers, and I wanted to add a little iridescent bit to it, so I added in the sunglasses. To create a visual triangle, I added some iridescent clouds and stars to the top right of the page, too. And for a finishing touch, a few exclusive sequins scattered around, too! What photos will you use with this sot, colorful kit?? 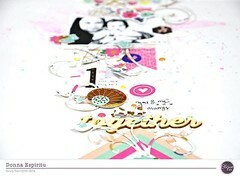 Categories: Locker Room | Tags: Audrey Yeager, Clique Kits Malibu, Die Cuts, Malibu, pink paislee, watercolor | Permalink.